King Solomon was the third king of Israel and is known as the wisest man who ever lived. Solomon loved God with all his heart, and gave offerings to God in abundance. At the beginning of Solomon's reign as king, God appeared to him and said, "What shall I give you?" Solomon responded, "O LORD, give me wisdom and knowledge that I may know how to judge these people." God responded by saying, "Because you did not ask for wealth or honor, but have asked for wisdom on how to judge the people I will grant you those things as well, and more than anyone else before you or after you." Solomon manifested so much wisdom that people from far away came and listened to him. During the 40 years of Solomon's reign Israel never had to go to war. Solomon ruled well as long as he kept his eyes upon the LORD. Unfortunately, Solomon married many wives, and some of them did not love God. 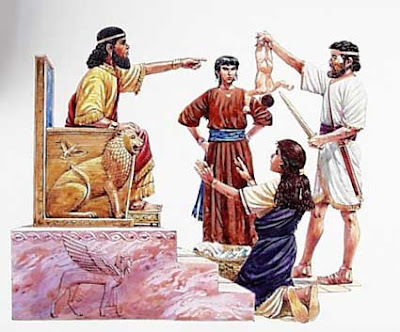 This proved to be a great stumbling block to Solomon and caused many problems. Towards the end of his life Solomon repented of his wickedness and turned back to God, who received him and forgave him. But the path of sin had been laid and had it's effects upon his children. After Solomon died his son Rehoboam made some drastic mistakes which caused the twelve tribes of Israel to split up, never to be reunited. It is so important that we remain faithful to GOD our entire lives.